OneSky provides industry-leading analytics for aerospace systems, particularly within the commercial unmanned aerial systems (UAS) market. Designed to enhance mission planning with advanced safety-of-flight analysis, OneSky leverages 28+ years of software modeling and simulation to put powerful predictive capabilities into the hands of pilots, operators, and systems integrators. Whether we are working directly with clients to assist in creating waiver applications, supporting full-scale systems with the OneSky UTM System, or embedding into existing software solutions via our web-services API, OneSky can support your mission or program from beginning to end! 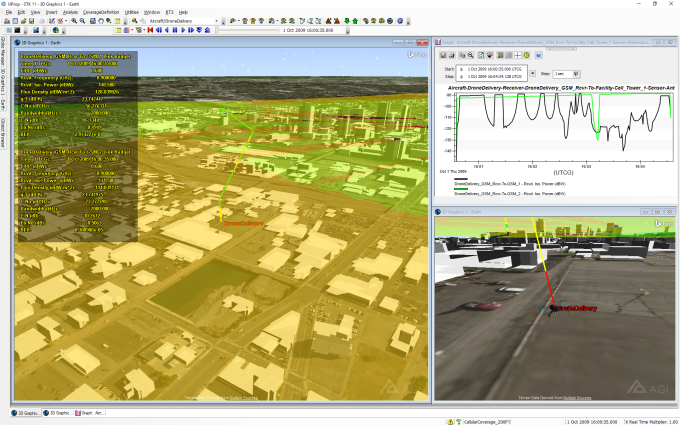 OneSky has an ever-expanding collection of analytical web-services focused on safety-of-flight for commercial UAS. From GPS/NAV analysis to advanced Comm-Link prediction services, our RESTful API provides unmatched capabilities and puts them in the hands of developers ready to embed our analytics into their applications. Leverage 28+ years of aerospace modeling and simulation expertise to create your waiver requests and get flying farther and faster! OneSky's engineering support can bring your concepts to reality with advanced safety-of-flight analytics and visuals. OneSky's UTM System is an enterprise-ready solution with flexible deployment options. Customized to support regulation compliance, the framework was designed to support user-supplied flight plans, airspace analytics, advanced terrain considerations, and more! Create your flight plan and monitor operations in real-time! Register to start using the free web portal BETA, and explore some of our capabilities for yourself. Create flights and explore analytical features, such as terrain considerations, satellite navigation (GPS) availability, and U.S. airspace restrictions.